Right after I read this book, I put it down and thought - what an incredible novel. I was so excited about it that I logged on to Goodreads in an attempt to write my review straightaway, only to find that I was at a loss for words on how to describe how much I love this novel and how wonderful I think it really is. 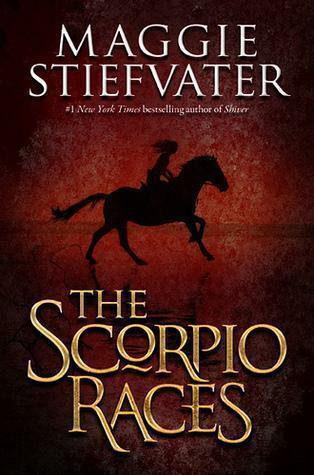 The Scorpio Races is magical and fantastical and breathtaking. If I thought I loved Maggie Stiefvater when I read The Wolves of Mercy Falls series, I was wrong. This is the book that has me deeply, irrevocably in love with Stiefvater's writing and storytelling abilities. The main story revolves around two key characters, Puck Connolly and Sean Kendrick. I feel incredibly privileged to have met them both and walked alongside them as their story played out. Puck is a refreshing character to me. She's the only girl in a set of three siblings, and while she does play homemaker and try to do domestic tasks (as would probably be expected of the sole female in any family in a conventional set-up), she also does something crazy and volunteers to ride in the races - something that normally only the males do. I like how she defiantly chooses to do something so radically different and unexpected (and actually goes through with it), because it says a lot about how brave and determined her personality is. It is, however, the periodic appearances of her fear that make her extremely relatable. She may have the courage to volunteer and ride, but that doesn't mean she doesn't have reservations about her choices. There are many events leading up to the races that portray a hint of this doubt and fear, and these moments are actually quite poignant as they show another side of Puck. Sean Kendrick, on the other hand, is a unique character from the start. It's easy to see that he has a way with horses and a practical head on his shoulders. But the further we get into the novel, his passion for the horses and for his dreams becomes apparent to the reader. He is markedly different because of his way with animals and his reined-in passion, but he doesn't go out of his way to flaunt it in front of the rest of the village. I enjoy reading about the brooding, mysterious type of guy - and Sean Kendrick would definitely fit that description. He has an appealing, earthy sort of quality about him that makes my heart skip a beat as I imagine him on a water horse. The novel is also filled with a plethora of secondary characters, including Finn & Gabe (Puck's two brothers), Corr (a water horse), Mutt Malvern (a hotheaded young water horse rider), Thomas and Peg Gratton (the butcher and his wife) and Dory Maud (a purveyor of selling interesting pieces in a shop she runs with her sisters). Though I won't go into depth about each and every one of them, it is imperative to state how well Maggie managed to bring each of their individual personalities to life and fit them into the story. Ever since I had first heard about this novel, it was the idea of the water horses that fascinated me. I'm very pleased to be able to confirm that the mythology of the water horses is done really well. Though it is quite violent in nature, there's also an enchanting draw to it. I personally like to thinking of the story as a portrayal of man attempting to tame the wild, while the wild itself refuses to be tamed. Apart from the beautifully played out mythology, watching the relationship between Puck and Sean develop and change over time was lovely. Unlike the books I read where the relationship/friendship springs into instant existence, it was slow and steady with them. It just made it all the more gratifying to read as the book continued. I have nothing but praise for Maggie Stiefvater and the way she writes. The Scorpio Races is impeccable. The descriptions are lyrical and magical and follow a certain cadence, and the language used makes reading the book a beautiful experience. Even though there are many tiny, often unremarkable scenes, they do serve a purpose in showing us a character, their personality or even a location. Using two different points of view was also an intelligent move on Maggie's part, as it allows for better insight to the minds, motives and emotions of our two main characters. I never thought it was confusing or misleading, but rather, I enjoyed how one chapter from Puck might lead into the next chapter from Sean and so on. ... definitely go out and get this novel! It's brilliantly written, with real and relatable characters and one incredible mythology to boot. Make time to read it, as I feel like once you get started, you'll never want to stop reading. Well, I can see why you were very proud of this review. I like how you break it down, covering certain aspects of the book. Reading it has given me more insight to the book. But, I'm not sure I know what a water horse is? Oh man, I totally loved this one as well! And I wasn't even a fan of Shiver, but when I got a copy of this one and kept seeing good reviews I figured I should pick it up. I'm so glad I did, because I totally fell in love with it... the characters, the setting, the writing, the mythology... all so freaking fabulous! I had a hard time loving this book. It's writing is no doubt SO beautiful! But I don't something about it for me just didn't click.. I think I just expected SO much more from it. I have this book and have heard so many good things about it. Can't wait to read it! Absolutely wonder review, Alexa! I have yet to read this book, but I'm hoping to het to it soon and I can't wait! Thanks for sharing your thoughts on the book, your review has made me even more excited! loving this book so so much! and sean *fans self* he's so wonderful. that quiet brooding type. i love it. and puck is total BA. great review. you hit everything on the spot. *Sigh* I LOVE The Scorpio Races. It might have been my favorite book that I read last year. It's just so gorgeous and atmospheric and WONDERFUL. I've already read it twice, and I know that I'm going to be reading it again. GREAT review! As always. fell in love with Thisby. All I can say is, read it. You won't be sorry you did.